The question of what it means to be adequately biblical in counseling is one that sparked significant debate for well over four decades. I’m under no pretense that this brief blog post will resolve the issue. This series has been primarily an introspective reflection on my own journey as a counselor who strives to be biblical. Early in my counseling experience, I thought being “biblical” meant “teaching.” I used the adjective, biblical, like a verb, to teach. If I wasn’t actively teaching from Scripture during a session, I wasn’t sure I was being biblical. The result is that I think I was too quick to speak in the form of teaching in counseling (James 1:19). 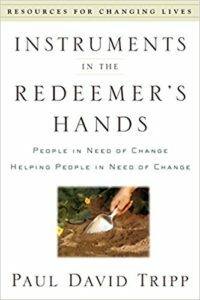 As I look back on those days, it felt like I was more concerned to validate myself as a “biblical” counselor than I was to assess what was most helpful to the counselee in a given moment or session. 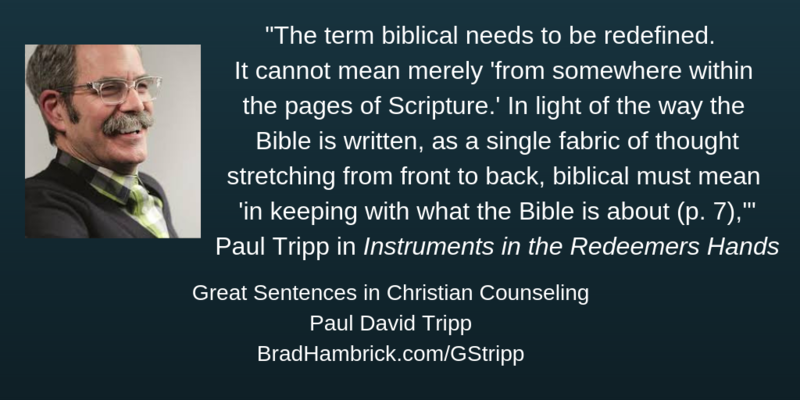 But that phrase “most helpful to the counselee” should not be in tension with the adjective “biblical.” To sense a tension between these two things had to mean I was either mis-defining “helpful” or “biblical.” That is where this quote from Paul Tripp alleviated this tension for me. To define biblical as “in keeping with what the Bible is about” means that listening well in a first session is biblical because it is part of God’s redemptive agenda for this person. To weep with those who weep is biblical, even without a proof text, because it is being an accurate ambassador for Christ. To ask insightful questions that draw out the motives of the heart (Prov. 20:5) is biblical even before it gets to the instruction. The Bible is about God’s redemptive agenda for each person he created. There are many things that are “biblical” in counseling which are not didactically delivered. I’ve talked about this before when I’ve contrasted the noun “counsel” from the verb “counseling.” It was my love for the Bible that led me to biblical counseling and, for a season, that led me to emphasize the teaching component of counseling over the other facets of counseling. Gathering history, making assessments, and garnering trust come before instruction in counseling. Reinforcing progress, identifying obstacles to future progress, and cultivating a context to sustain change come after instruction in counseling. All of these objectives can be done biblically – in a way that represents God’s redemptive agenda for the counselee. If each is done well, a counselee’s confidence in God, the gospel, and the Bible increases as the counselor – acting as God’s ambassador – represents God well. This growing confidence in God, the gospel, and the Bible is a defining mark that counseling is being done in “biblical” way. Nothing in this reflection is meant to downplay the importance of instruction in counseling. The content of our counsel is vitally important; it’s just not exclusively important, as if nothing else mattered. When I used “biblical” as a synonym for “teaching,” I came very close to this latter position. I was so passionate for one phase of counseling that I rushed / neglected the others and, as a result, I do not think I was as accurate of an ambassador of God’s redemptive agenda as I should have been. My encouragement to fellow counselors: be “in keeping with what the Bible is about” in every phase of counseling – history gathering, assessment, garnering trust, instruction, reinforcing progress, identifying obstacles, cultivating context for sustained change – so that each time we offer instruction from Scripture it is clear to our counselees that we are representing God’s redemptive agenda for their live accurately.